In my time doing sites and social media with this blog and other sites, I've been around plenty of times when the Internet has had a knee jerk reaction and lost their minds over something so stupid it makes you wonder how these people get on with their daily lives. The news this week surrounded Microsoft being accused of using a racial slur in an email to promote Dead Rising 4, a thought that was so stupid I found myself wanting to type up this post. Reading the above news on many main gaming websites (who of course were disgusted at the Promotion/email department of Microsoft HQ being such vile people) it made Larry Hyrb (Major Nelson) take to Twitter to issue an apology for it. This made me wonder when did the world become such a place that seemingly goes out of its way to find things offensive. As a none racist or oversensitive person it never even crossed my mind about the lettering used for the header of the email above. And without looking for racism and even opening the email fully, as a gamer I knew it would be to promote Dead Rising 4 right away. This isn't the first time the Internet has made most of us normal people facepalm at their utter stupidity, so here is a little trip down memory lane at where the Internet went stupid for a day or two then forgot it ever happened. 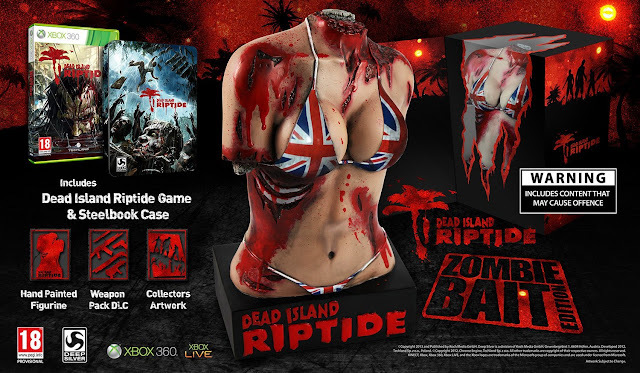 The time a game company dared to make "a statue of a mutilated bikini-clad corpse" as Polygon worded their piece on it all when it was happening. I myself just saw yet another overpriced collectors edition that would have been ignored had it been a male and not a female bust, but the Internet saw something so vile that they took to Twitter to share how utterly vile and disgusting this hand painted resin statue was to them. Looking back now did it harm anyone or bring the world to fiery end, no it didn.t. I would bet though that the press this edition got back then made it more of a talking piece to those who still picked it up when it released, and if anything made more people go out and look at buying it thanks to the free publicity. Hitman Absolution is all about Agent 47 sneaking around killing people for work, someone has to do it after all. But with the E3 trailer released and most of us happy using wire to strangle people to name just one thing that our Agent used to kill people, the one thing that peed off the Internet most was dressing women in leather clothes and making them look like a group you wouldn't want to mess with. Once again things calmed down and we all enjoyed the game for what it was when it released, killing Nuns and sticking them in a fridge just never gets old at all. Good times. With my mind running dry on when the Internet was miffed, I reach out to you guys. What times can you remember the Internet being deeply annoyed for the day only to forget all about it the following day? Drop a message in the comments below, or tweet me and I will add them into this post. Hopefully people see my point here as this post was meant to highlight how silly we can be at times, and most of the time something you're really annoyed with actually isn't that bad at all when you think about it.